The cheapest ticket on the high-speed Acela trains will be 25 percent less expensive this spring. Amid a slowdown in business-class travel, Amtrak said it will make a 25 percent cut in the lowest fares on its high-speed Acela trains. The price for a one-way ticket from New York to Boston will drop to $79, while New York to Washington D.C. tickets will sell for as little as $99. The limited number of the lower rates will be available with a 14-day advance purchase only from March 3 through June 26. The Acela, which travels the Northeast corridor slightly faster than other Amtrak trains, also serves Philadelphia, Newark, New Haven, Providence, and of course Vice President Joe Biden's Delaware. 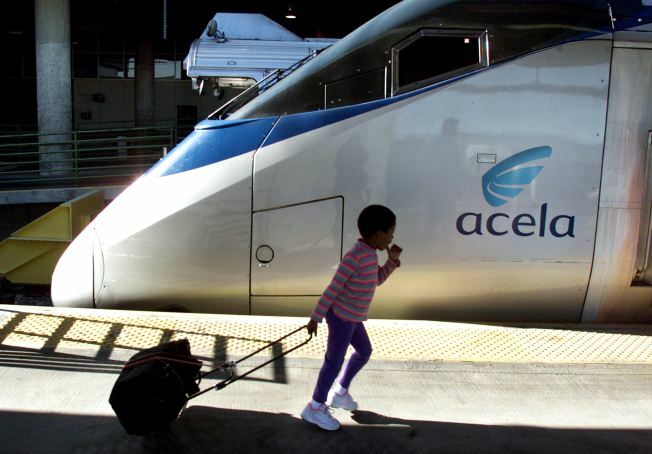 Despite the cuts in Acela ticket prices, the fast train still may not be the best bargain, according to the travel site NewYorkology, which compares fares from the airlines and business-class buses. However, the bus and train may indeed be the best deal if you'd normally jack up your trip cost by relying on a cab to or from the airports.